On top of the targets and demand pressures, there is also the immediate challenge for all endoscopy services to achieve JAG accreditation, which could result in some downtime in services as refurbishments/upgrades of current facilities are carried out. Vanguard Healthcare is a specialist in helping NHS Trusts to achieve JAG accreditation. 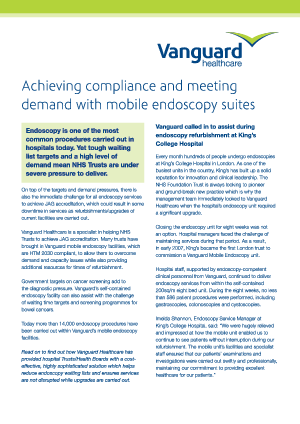 Many trusts have brought in Vanguard mobile endoscopy facilities, which are HTM 2030 compliant, to allow them to overcome demand and capacity issues while also providing additional resources for times of refurbishment. Government targets on cancer screening add to the diagnostic pressure. Vanguard's self-contained endoscopy facility can also assist with the challenge of waiting time targets and screening programmes for bowel cancers. Today more than 11,000 endoscopy procedures have been carried out within Vanguard's mobile endoscopy facilities. This case study shows how Vanguard Healthcare has provided hospital Trusts/Health Boards with a cost-effective, highly sophisticated solution which helps reduce endoscopy waiting lists and ensures services are not disrupted while upgrades are carried out.